Towards the middle of the 1970s, it seemed that quadraphonic sound would be “the next big thing” in Hi-Fi. As a progressive manufacturer, B&O had to get involved, and Beomaster 6000 4channel was the centre of their first quadraphonic system. Some years previously they had offered “ambiophonic stereo”, built into the Beomaster 1001 and 4000, and as an add-on unit for other systems: the Ambiophonic Surround Adaptor. Text copyright © Beocentral. Unauthorised reproduction prohibited. The ambiophonic system was simple, a monophonic “rear” channel derived from the difference between the left and right main stereo channels was played through two small loudspeakers. This system did not require specially prepared recordings, but was only capable of providing a fairly basic “surround sound” experience. Quadraphony was different. By using 4 power amplifiers and four identical loudspeakers it could be made far more flexible and the effects it could produce could in theory be made more involving. The problems centred around finding a suitable “carrier” for the four channel recordings. Open reel tape, although technically an ideal solution, had had its day as far as mainstream domestic applications were concerned by this time, so this could not provide the answer. 8-track cartridges were issued in quadraphonic form, but limited playing time and poor quality (despite wide tracks and a high tape speed) meant that these were also less than ideal, leaving the only remaining alternative, the quadraphonic LP. Text copyright © Beocentral. Unauthorised reproduction prohibited. In a fashion that would become depressingly familiar, the industry released a number of non-compatible competing ways of encoding 4 channels onto an LP. This left individual manufacturers such as B&O having to make a decision over which format to back. In the end, they hedged their bets by fitting the decoder circuit of Beomaster 6000 4channel on a replaceable module, the idea being that this could be economically replaced if a new system was introduced. The standard fitment supported the “SQ” system, favoured by Sony amongst others. To cover another alternative, a discreet 4 channel input was also provided for a turntable with a built in decoder, such as the Beogram 6000. This was fitted with a CD4 decoder, a system originated by JVC, and provided an equalised line-level 4 channel output. Provision was also made for a conventional stereo turntable or tape recorder, complete with a switch to select a line source or magnetic pickup as the input. Connections were also provided for a quadraphonic tape recorder and quadraphonic headphones, though B&O never marketed either of these products. Text copyright © Beocentral. Unauthorised reproduction prohibited. To enable the listener to accurately position themselves in the centre of the soundstage, an ultrasonic remote control was made available as an optional accessory. The remote control unit itself was similar to that provided with the Beovision 6000 TV set, and operated under the same principle of a matrix of 4 high and 4 low frequencies, offering precise and accurate control of 14 functions. As well as volume and L/R and F/R balance adjustments, the sources and 5 preset FM radio stations could be selected. This of course required a means of electronic signal routing in the receiver, and even though 4 contact relays were available, the constraints of space meant that an alternative switching method had to be used, so a system using biased silicon diodes was employed. A similar system was later used in the Beomaster 1900. Text copyright © Beocentral. Unauthorised reproduction prohibited. Having arranged a purely electronic method of routing the signals, the designers then made the control of volume, balance, tone etc mechanical! Whilst the user saw elegant touch switches and linear displays that moved as if by magic, inside a complex assembly employing a DC motor, electromagnetic clutches and 4 gang potentiometers was fitted. The displays worked in a surprisingly simple way, a loop of black tape with a coloured red gap in it was wound around the potentiometer shaft, so that the red line appeared to move as the shaft rotated. Again, a similar but purely mechanical version of this arrangement appeared years later, this time in the Beomaster 1700. The FM tuning used a larger version of the black tape idea for the dial, though the control was not included in the clutch system, instead it was operated by a large and heavy disc on the control panel. This styling detail would in future be seen again and again on B&O equipment, including as a digital control on the Beomaster 8000. Text copyright © Beocentral. Unauthorised reproduction prohibited. The novelties of the quadraphonic system aside, the Beomaster 6000 4channel was fairly conventional. 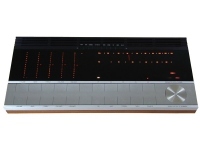 The FM tuner section was very similar to that of the Beomaster 3000. The power amplifiers owed much to the design of the Beomaster 901, the reduction in component count that the Darlington transistors made possible would have been welcome in the cramped Beomaster 6000 4channel chassis. Larger transistors and higher power supply voltages (60V) raised the output to 40W, though strangely AC coupling to the loudspeakers was still employed, requiring 4 large electrolytic capacitors to be squeezed in somehow! The normal filters and switchable loudness circuit that one would expect to find on a product in the “High Fidelity” range were all there, and along with the other functions that required mundane mechanical switching, the buttons to control them could be found in a bank of pushbuttons in the centre towards the back of the set. As there would in all probability be 4 loudspeakers connected, the option of ambiophonic reproduction was possible too, along with mono or “stereo” reproduction through all four loudspeakers. An important button missing from this bank was one to turn off the mains power, so a lever marked “on” and “off” was fitted, almost as an afterthought, on the rear panel. The tuning wheels for the 5 FM preset stations were also oddly located, under the lip on the front of the set. Text copyright © Beocentral. Unauthorised reproduction prohibited. There was no doubt that the Beomaster 6000 4channel was amongst the finest quadraphonic receivers available, but as an expensive range topping model, it was only really viable whilst there was an interest in quadraphony on the part of both the public and the record producers. 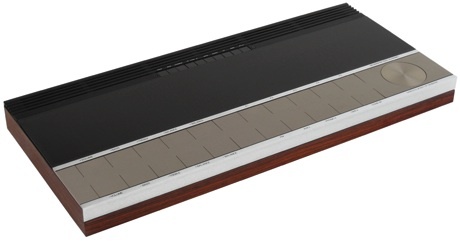 As we now know, “the next big thing” never really happened, and as interest faded, the Beomaster 6000 4channel was quietly dropped from the range. The writing was really on the wall in 1976 when the matching cassette tape recorder, the Beocord 5000 was introduced. It was a stereo machine... Text copyright © Beocentral. Unauthorised reproduction prohibited.